A summer in 1993 in Spanish Harlem, a very different Spanish Harlem from today, finally reveals the secret past of Cuban-American Negra Centron. A childhood secret torments the life and stifles the growth of a beautiful woman. To protect her secret, she becomes strange bedfellows with Tony Perez, a woman magnet and small time hustler; to the dismay of those her lover her most, namely, her mother Millie and best friend Chee Chee. The ancient religion of the Yoruba people of Nigeria, known as Santeria and Candomble in the Americas, is the engine behind this dramatic three act play. This African-evolved religion and its magic is the backdrop for this tale of love, self-hatred, deceit, homophobia, intra-racism, classicism and betrayal. Magic, ritual, and destiny are the threads unraveling this drama/thriller. As a three act play it won two staged readings and actor Ella Joyce originated the role of Carmen over 22 years ago. It has finally been revised as a play, and adapted as a screenplay recently placing semi finalist and quarter finalist in two international film festivals. 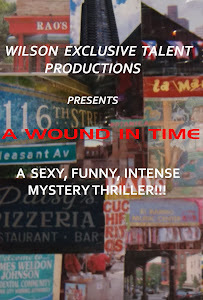 I am producing the play at Nuyorican Poets Cafe opening on October 22nd for an 8 show run.